The Department of Labor’s weekly jobless claims continued to surprise this week as seasonally adjusted initial jobless claims fell to 202K from a revised 212K last week. This comes in complete contrast of what briefly appeared to be a bottoming out of claims earlier this year, as that increase has now been more than erased. Not only is this print of 202K the 213th week below 300K, but it is also a low for the current cycle. Even more impressive, it is the lowest weekly claims number in nearly 50 years!Start a two-week free trial to Bespoke Premium to access our interactive research portal. You won’t be disappointed! 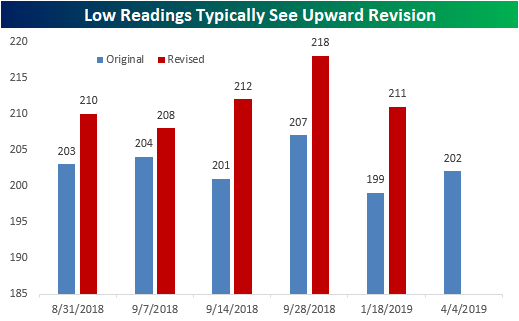 As tempting as it is to rally around this small factoid, we actually saw lower prints earlier this year that were later revised higher. Back in the third week of January, the original release of initial jobless claims came in at a low of 199K which of course earned the title of lowest since November of 1969. This 199K was later revised all the way up to 211K. 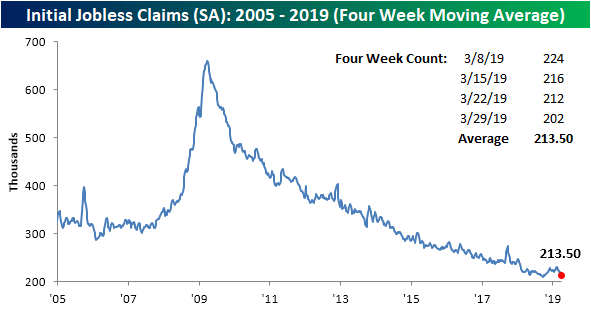 Similarly, in late August and early September, initial releases of jobless claims came in near similar levels between 201K and 204K also to be significantly revised. Let’s see if this week’s print gets revised higher as well. Revisions aside, the less volatile four-week moving average has once again reaffirmed this week that highs from February have peaked. Settling at 213.5K, the moving average is now right back to where it was on October 5th. This week’s data also brings the moving average within 3K of the current cycle’s low of 210.5K (from September 21st). 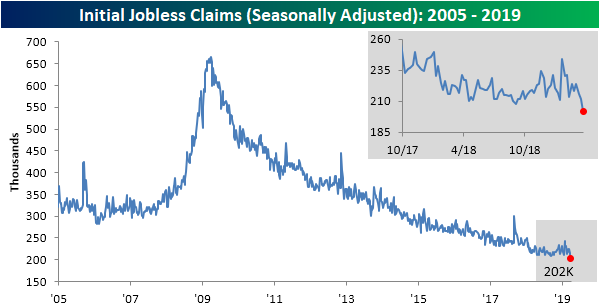 Turning to the non-seasonally adjusted number, jobless claims fell from 190.1K last week down to 182.6K. This is well below the average for the current week of the year since 2000. 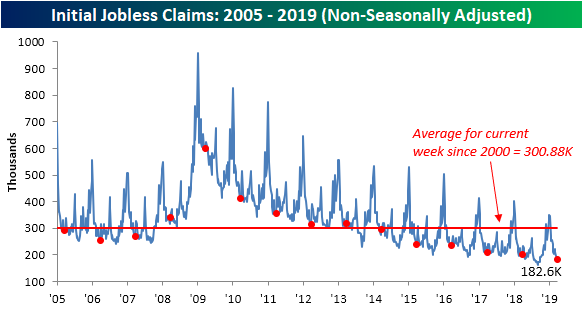 It is also healthily the lowest claims print for the current week of the year going back to at least 2000.